Mt Bromo Sunrise Tour 2D1N is one of Mount Bromo tour package to enjoy Bromo Sunrise at high peak (mt Pananjakan), Sand Caldera and Crater. Mt Bromo Sunrise 2D1N, mount bromo sits in the middle of a vast plain called the Sand Sea. The typical way to visit Mount Bromo is from the nearby mountain village of Cemoro Lawang. From there it is also possible to take an organized jeep tour, which includes a stop at the viewpoint on Mount Penanjakan (2,270 meters). 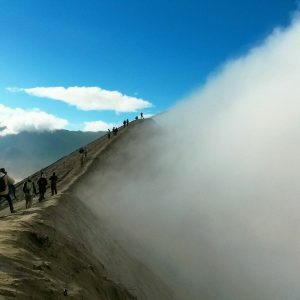 The best views from Mount Bromo to the Sand Sea below and the surrounding volcanoes are at sunrise This tour package need Two days and one night duration. Mt Bromo Sunrise Tour 2D1N started from Surabaya or Malang depend on the visitors arrival and spend 1 Night at the hotel in mt Bromo area. go back to the hotel, have a breakfast, check out and then continue driving to Surabaya or some place for drop out and holiday Mount Bromo Sunrise Tour 2D1N is FINISH. Diposkan dalam Mt Bromo Sunrise Tour 2D1N dan dilabeli mount bromo sunrise tour, mount bromo tour package, Mt Bromo Sunrise Tour 2D1N, mt bromo tour. Markahi permalink.